This essay has been extracted from The Historian and her Craft Collected Essays and Lectures of Romila Thapar recently published by the Oxford University Press and republished here with permission. For many decades now it has been maintained that Indian civilization has shown an absence of dissent and protest. This has become so axiomatic on the Indian past that those who have occasionally questioned it have been labelled as anti-Indian. Such a view stems from a nationalistic oversimplification of Indian society as a vision of harmonious social relations in a land of plenty. Superimposed on this were the preconceptions of idealist philosophy that dissent required materialistic underpinnings, and philosophical themes of materialism in Indian thought have generally received short shrift from contemporary commentators. It is only in recent years that some attempts are being made to suggest that neither materialist philosophy nor dissent were wholly marginal to Indian society. It still remains fashionable in some circles to deny the opposition between forms of orthodoxy and heterodoxy in the ideological traditions of the past, arguing that Indian religions were not based on dogma. Yet the history of groups identified as having a community of religious beliefs, rituals and behaviour, among Buddhists, Jainas, Vaiṣṇavas, Śaivas and Tantrics, is strewn with sectarian dogmatism which found expression not only in interreligious but also in inter-sectarian rivalries, sometimes of a violent kind. It has also been argued that there are no words equivalent in meaning to dissent and protest in the early Indian tradition; however there is no shortage of terms connoting what is implicit in the concept. Words for dissent and non-conformity such as vibheda , vimati , asammati , viparitta , ananukūla , are described by modern commentators as negative constructions and therefore alien to the language. The same can be said for words such as dissent and non-conformity which are also derived from negative constructions. What is of historical significance is not so much the syntactical structure of these words but the particular period and the historical context in which they find expression. In any case these terms are new in their specific use in other civilisations as well. The secularisation of the adaptation of terms such as dissent and protest is a relatively recent phenomenon, but this does not preclude the occurrence of actions of dissent and protest in earlier times. Dissenting actions whether symbolic or overt, may not be consciously described as dissent, yet the dissent may be implicit in the nature of the action. Dissent can be limited to questioning established ideologies or belief systems, becoming the core of a new ideology. The expression of dissent can thus be relatively confined until such time as it mobilises action. Protest, therefore, involves more than dissent; it requires ideology, mobilisation and clearly defined action. The action has to be legitimate for the groups using it and is often regarded as illegitimate by those whose views are being questioned. The recognition of a protesting group is therefore a gradual process in history and occurs only when such a group has gathered social force and has become, as it were, politicised. This often coincided with the acquisition of property and the establishment of relations with political authority; which, incidentally, frequently became a point of departure in that it brought about opposition within its ranks to the new situation. Conflicting views over the acceptance of property and involvement in society could be a cause for friction. Among the well endowed sects, there were rivalries over succession to office which entailed the management of property. Whatever the reasons, breakaway groups justified the schism by appeal to doctrine. It would seem self-evident that any society which is complex and registers change, as has been the case with Indian society, must also register ideas of dissent, protest and non-conformity; otherwise the very fact of change would be nullified. Protest and dissent are not always expressed through violent action and there is normally a large spectrum ranging from a rather passive non-conformity to violence. Equally essential is the mechanism for containing dissent and protest, which tries to avoid the disruption of society. During the first millennium BC when the early Indian tradition was being formulated, evidence of overt oppositions is limited. But the expression of dissent through the questioning or even fl outing of social norms is conspicuous. Sometimes it took the form of opinion systematized in the views of religious and philosophical sects; but it was also expressed through symbol and action. This often occurred in the form of opting out of society as it were, through various types of renunciation. But not all of these can be seen as protest. Some were attempts at seeking individual salvation and had therefore an other-worldly orientation. Only those forms can be regarded as expression of dissent which satisfy certain criteria. Opposition to existing social norms had to be consciously maintained even if it was expressed at a symbolic level; the new forms could become alternate sources of power; and the attempt was not so much to disrupt the existing system as to set up a parallel or alternate system. These criteria are a necessary pre-condition. Not all renouncers were or are protesters, for there are many in the past and even today, who, rather than utilising renunciation as a technique of dissent, exploited it for mundane ends. One of the paradoxes of the Indian tradition is that the renouncer, in spite of migrating out of society, remains a symbol of authority within society. An explanation of this paradox may emerge from an analysis of the social role of the renouncer. Apart from those who through austerity and severe discipline, both mental and physical, sought extrasensory power, there were many others who renounced their social obligations, joined an order and far from propagating a life-negating principle, sought to establish an alternate or parallel society. They combined in themselves the charisma of the renouncer as well as the concerns of social and occasionally political dissent. They were neither revolutionaries nor radical reformers; they can perhaps best be described, as I have argued elsewhere, as the makers of a counter-culture. Their migration is symbolic since they re-enter the social arena in a changed form. Such forms of renunciation were open to all. It was generally assumed however that members of the higher castes and upper levels of society would use this as their form of dissent. For those lower down, migration was rarely symbolic for it carried the bitterness of necessity. Some who joined the renunciatory orders were attempting to overcome the inequities of caste status by joining non-caste groups. Others, such as the peasants, were sometimes forced to migrate to express their discontent. I would like to examine more closely the evidence for the two ends of the spectrum: the open renunciatory groups and their relations with society, taking the case of the Buddhist saṅgha, and at the other end the specific limited group of the peasantry who, when they migrated, were articulating a particular discontent. The first millennium BC is characterised by changes of at least three kinds which had a bearing on the realm of ideas. These changes were the evolving of a recognised social stratification, the emergence of towns and urban centres and, lastly, adjustments to the increasing authority of the state. It is with reference to these that I would like to consider the question of dissent. Social stratification assumes divergent forms in different systems. In the monarchies frequent reference is made to castes functioning in the framework of the fourfold varṇa system. Within the hierarchy of this system the elevation of the brāhmaṇas brought, as its counter-poise, the new category later referred to as untouchables. The hierarchy of the fourfold system was based on the distribution of power, authority and access to economic wealth (whether in heads of cattle or in land) and kinship networks. The fact of untouchability highlights an additional feature—the distinction being justified on the basis of ritual purity and pollution which converted the caṇḍālas and other such categories into excluded groups. The oligarchies or chief ships do not register a four caste stratification to begin with, but here the emphasis separated the landowning kṣatriyas of the rājakula from other clan members and these in turn from the slaves and labourers, dāsa-bhṛtaka, who worked the land. With the extension of agriculture, the growth of centres of craft production leading to networks of trade and the increasing political authority of the state, urban centres became a recognisable feature of the cultural topography. Most of them combined the function of capitals of the newly emergent states, the earlier janapadas, as well as centres of trade. Although the rural-urban nexus remained strong, the urban ethos was different. Urban centres provide evidence of a stratification in which the seṭṭhi, the merchant and trader was regarded as important. Towns were looked upon with some suspicion by the brāhmaṇas who declared that the good snātaka should avoid living in such places. Evidently social taboos were liable to be eroded in the flux of urban life. The bulk of urban society consisted of those who laboured either as artisans or as wage-earners in commodity production, constituents of the amorphous category described as śūdras in the texts. This was also the period which saw the establishment of the state as embodying the necessary authority for the maintenance of law and order and for the protection of the people. In theory, the state, whether it took the form of a monarchy or an oligarchy, is an alternative to an otherwise nightmarish chaos. The Mahābhārata compares the kingless state to the lawless condition of the desiccated tank in which the big fish devour the little fish. The Rāmāyaṇa paints a distressing picture of the afflictions which beset a land without a king. Drought is almost by implication associated with bad government or no government. Buddhist texts are equally graphic in depicting civil strife in the absence of a state. The state was seen as an enforced necessity rather than a naturally evolved institution and the element of contract is implicit to a lesser or greater degree in most of these explanations of the origin of the state, irrespective of whether the state came about through divine intervention or the choice of the people. Whatever its origins, the state as representing political authority was new to the earlier lineage identity now being gradually weakened. In the monarchies the concentration of political authority was strengthened by religious sanction through a range of rituals such as those linked to status and power as in the rājasūya , vājapeya and aśvamedha in particular. These trends incorporating social stratification, the power of the state and the economic thrust of the extension of agrarian systems and trade, became the substratum of historical activity in subsequent centuries as well. States expanded outwards from geographically nuclear regions, tribes and occupational groups were converted into castes, waste land was cleared for cultivation, new routes were forged and markets for trade, and this process provided a continuing historical momentum in the subcontinent up until recent centuries. This is in part reflected in the constant emphasis on the fear of chaos in the texts of later centuries. The emphasis did not arise from a paranoia regarding disorder but rather reflects the repeated formation of states in new areas which had on each occasion to be justified. State formation is a recognisable feature of historical change in the Indian subcontinent during the millennia AD. This necessitated highlighting the difference between the conditions within a state and non-state societies. Contrasting of chaos with order was part of the required emphasis on the sanction of the state, its legal authority often equivalent to coercion, which was summed up in the word daṇḍa. The literal meaning of daṇḍa, ‘the rod’ was not limited in connotation to physical force alone but was symbolic of all authoritarian sanctions which the state could use and which were essential to the functioning of the state. Significantly the legal codes included a comment on all the minutiae of social and political life because the dharmaśāstras were again the primary texts of state legitimation. The stress on consensus in matters relating to law was in part due to the continuing authority of customary law and in part the absence of a uniform code. The sanction of the state therefore was endorsed by the appeal to a multiplicity of laws arising out of the separation of varṇas , śreṇīs , jātis , janas , which were sought to be ordered within the varṇa framework. The emphasis was on the disparate but coherent functioning of these various identities rather than a universal law to cover all identities. The earliest expression of at least minimal dissent comes to us from the Upaniṣads in the earlier part of the first millennium BC. The search for a way to ensure liberation from rebirth and a better comprehension of man in the universe led to a questioning of the efficacy of existing forms such as the sacrificial ritual and a discussion of alternative techniques such as yoga , tapas , dhyāna. These have generally been interpreted as procedures for attaining mokṣa or liberation. Yet embedded in this debate is a call away from social mores; a non-conformity which is expressed through renunciation and migration to the forest. That acquisition of knowledge required a distance from society is in itself a rejection of conformity. Those that concerned themselves with such ideas were a restricted group and their autonomy and isolation was respected. The more apparent social tensions and differences were doubtless resolved more easily in a society which was characterised by a smaller hierarchy of stratification, with fewer economic disparities in a pastoralcum-agrarian system and with the authority of the over-arching state still to come. The margin for non-conformity in such societies is limited. Migration to the forest was at one level symbolic but at the practical level the absence of a vast social surplus made it easier to live off nature than off the village. This perhaps partially explains why renunciation is by and large alien to the Ṛg Veda and becomes important only in the more complex society of the later Vedic period. In the earlier society there is one category of persons who had the licence at least to indirectly comment on conformity; these were the poet-bards. Their expression of dissent took the very subtle form of gentle mockery to which even the gods were not immune. But their power lay in their eulogy of those heroes who were munificent gift-givers and in this the heroic chiefs may have made efforts to appease them. This relationship is seen even more clearly in the earliest Tamil literature, the Śangam. But the increasing importance of renunciation weakened the freedom of the bards and the renouncer gradually became the key figure associated with dissent. 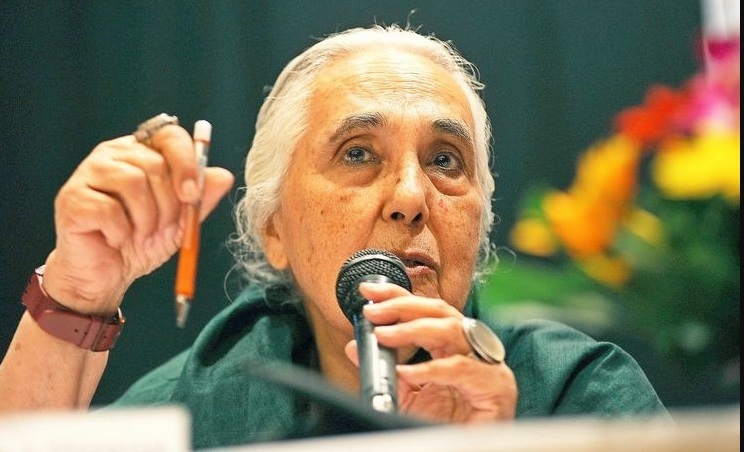 Romila Thapar (born 30 November 1931) is an Indian historian whose principal area of study is ancient India. She is the author of several books including the popular volume, A History of India, and is currently Professor Emerita at Jawaharlal Nehru University (JNU) in New Delhi.